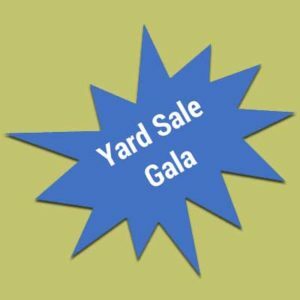 TEMV’s Yard Sale Gala is Sunday, August 6th, from 8 a.m. – 2 p.m.—and this year, we’re ramping it up with kids’ activities (including a bounce house), food, and beverages! Here’s how you can help make it a success for TEMV and our community at large. Bring in your items for donation! Before August 6, go through your belongings and put those you don’t want or need in a box or bag to bring to the temple. If you want the building open for delivery, email yardsale@temv.org and we’ll make sure that it is. Remember, the more items you donate, the more TEMV can make, and we all know our temple needs the funds. If you have any questions, please e-mail yardsale@temv.org. Please do not put your donations in the religious school—we’ll just have to move them upstairs. Help us price items beginning July 24: If you want to help, e-mail yardsale@temv.org. The more people, the more fun! Tell all your friends to come shop on August 6!